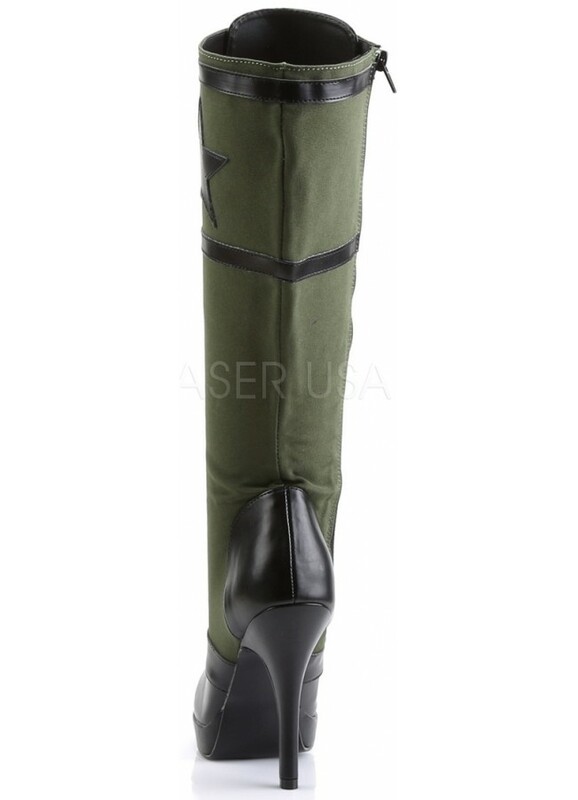 Inspired by the Army, these olive green drab knee high boots are accented with black faux leather stars and stripes. March to your beat in these military inspired high-heeled women's knee boots. Olive green canvas boot is accented with black faux leather stars and stripes with ace up front The black stiletto heel is 4 1/2 inches high with a slight 1/2 inch platform. Military style stars and stripes accent the shaft. Full inner zipper. Item Number: PL-ARENA-2022 | Approximate Size (Inches): 10.00 wide x 12.00 deep x 4.00 high | Approximate Shipping Weight: 3.00 lbs.